Ok, I'm seriously hungry for some lunch right now, so this will be quick! 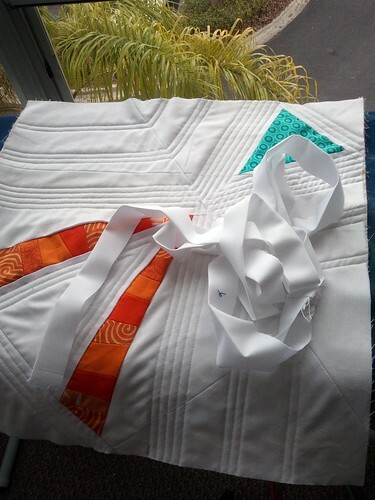 Binding this little guy today so that I can put it in the official entry section of the Tangerine Tango Challenge. The contest ends March 2nd, so you still have time! I don't think mine will win anything because I took a completely different, more artsy/abstract take on it, and there are some beautifully pieced minis over there [this and this might be my favorites!]. Oh well, it was fun! I spent some time the other day unpicking some straight-line quilting on this quilt I gave my boyfriend for Christmas. 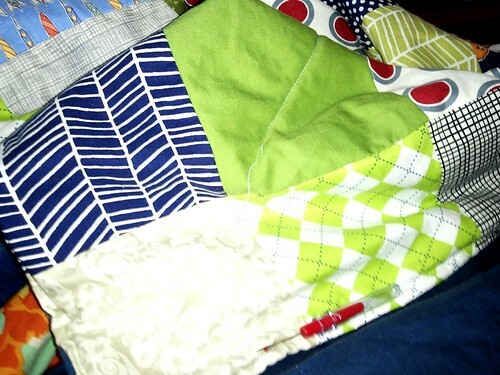 He's been using it [gingerly] because as you can see on this corner, I didn't do binding, I made it like you would a coaster, and have just been trying to add quilting for stability, but it is technically usable. Just probably wouldn't do great in the wash! Anyways, I can't wait to actually get some quilting on here that works [it's backed in a cuddly plush fabric that isn't minky, but the same idea] because this quilt has a saga. That's right folks, not just a story behind it, but a saga. Indicating both disasters and ultimate triumph. Except I haven't reached the triumph stage yet. Hopefully soon! Then of course I'm still working on my item for the Sliced contest, I've decided to make both my mini designs for the Modern Mini Challenge and then decide which I like better, and I need to do some serious work on my Pillow Talk Swap item. Now, to run errands, eat my weight in sesame bagels [seriously, how are they so good?! ], maaaaaybe run to the only modern[ish] quilt shop around here, and safety pin about 250 swaps for Thinking Day that my Girl Scout troop is going to tonight [any Girl Scouts out there that just got hit with a wave of nostalgia from swaps and Thinking Day?]. never count yourself out of a contest! I love your piece for the tangerine tango!